All Saints’ Cathedral, Kampala, parishioners were thrilled by President Yoweri Museveni’s Shs 500 million pledge towards construction of the new Cathedral at Nakasero hill. President Museveni’s promise on Sunday November 04, 2018 came after touring the construction site. The president said such collective effort exhibited by the parishioners is a testament of development and unity. “I congratulate all of you upon the decision you undertook to build a new house for the Lord. It would be easy if all Christians were following what Jesus did. By engaging in income-generating activities, the church would be built in short time,” Museveni said. The jovial president encouraged Christians to work hard and emulate Christ who was not only a preacher, but also a carpenter. “Besides feeding the hungry, preaching and healing the sick, Jesus was also a carpenter. Christians must engage in an economic activity, especially in commercial agriculture, service sector or ICT,” he added. The Archbishop of the Church of Uganda and Bishop, Diocese of Kampala, The Most Rev Stanley Ntagali, commended the president for the donation and for being a good neighbor of the Cathedral. Archbishop Ntagali said that the church is always grateful for the continuous support and partnership with the government in serving the immense community needs of Ugandans and all people living in the country. “At this cosmopolitan Cathedral, we continue to diligently serve a diverse peoples from the city, entire country and international communities,” Ntagali said. 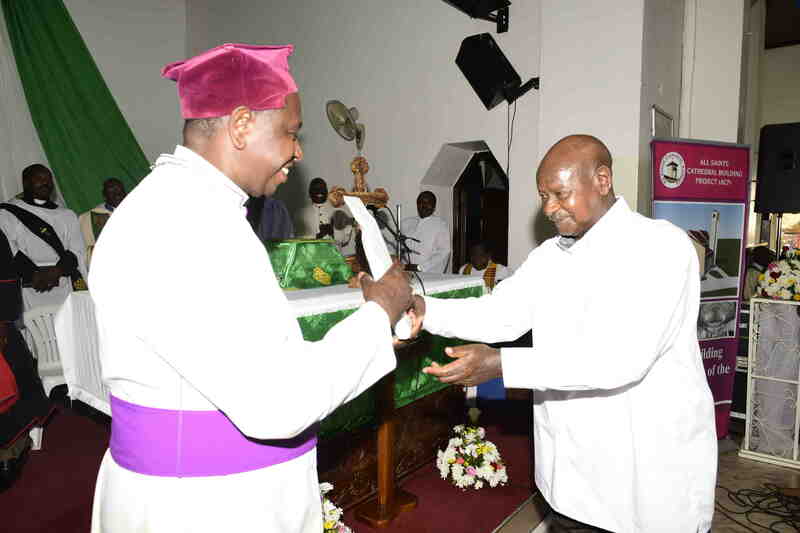 Archbishop Ntagali told President Museveni that the Cathedral is being built in phases, and that it would seat 5000 worshippers in one service. It will also have parking and office space and a modern canteen. The service was attended by government officials including Speaker of Parliament Rt. Hon Rebecca Kadaga, Ministers and various Members of Parliament. All Saints’ Cathedral, Kampala, is located on Nakasero hill and is the headquarters of the Diocese of Kampala for which the Archbishop of the Province of the Church of Uganda (Anglican) is also the Diocesan Bishop. For over 106 years, All Saints’ Cathedral parish has grown to over 6,000 worshippers today and remains a Cosmopolitan Cathedral serving diverse people and cultures from the entire country and the international community. The current sanctuary, which has been expanded three times in its life, now fills to capacity with an overflow of congregants occupying three large tents erected on the church compound. Under the leadership of Archbishop Livingstone Nkoyooyo (RIP), the Cathedral acquired plots 2, 4 and 6 on Lugard road by 2004 to address the expansion and physical development needs. The 7th Archbishop, Henry Luke Orombi (2004-2012), led intensive consultations resulting in the design of a suitable new Cathedral, and broke the ground with phase one works. His Grace Archbishop Ntagali re-commissioned the continuation of the construction works (Phase 2) in May 2017. Phase 2 includes the superstructure of the Sanctuary to achieve a covered and lockable building. The scope involves walling two galleries in structural reinforced concrete frame, roofing, windows and doors, a 12-floor bell and prayer tower, five Chapels, five Vestries, Immersion Baptistery and an elevated Altar able to seat 100 ministers and 70 persons in Altar response. Phase 3 will include finishing, furnishing, fittings and equipment. The design of the new Cathedral presents a unique symbol of the Christian faith and will offer tremendous opportunity for spiritual expeditions to the blessing of the city and nation at large. When finished, the new Cathedral will be such an iconic Sanctuary for generations, to the glory of our Almighty God.